As a designer Amy is interested in exploring the crossovers between design and science, through a highly experimental and research driven practice. Using speculative design work she investigates the implications of engaging with new technologies, such as biotechnology. Employing her work as a vehicle to provoke debate, and discussion, into the potential ramifications of using living materials to create our future products. Alongside her speculative work Amy continues to work within laboratories with existing life science technologies, such as tissue culture, to further her research and understanding of the current capabilities of these technologies. One of the most influential periods of time spent working within a lab was during a residency at SymbioticA “the world’s first artistic laboratory dedicated to the research, learning, critique and hands-on engagement with the life sciences”. She is currently collaborating with tissue engineers at Kings College London, to read more about this research please click here. Amy has also worked with synthetic biology in her role as design advisor to the 2012 UEA NRP iGem team. vía ABOUT — AMY CONGDON. 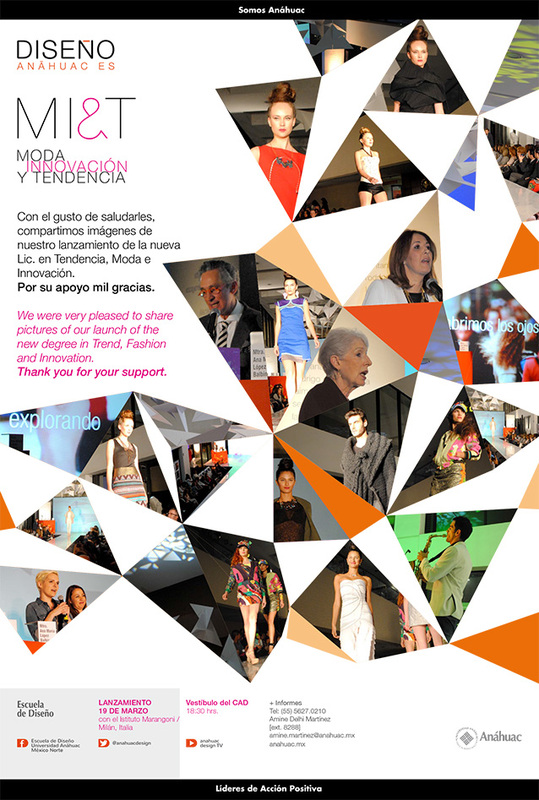 Con la presencia de Cristina Morozzi del istituto Marangoni de Milán, Italia, la Universidad Anáhuac México Norte presentó el pasado jueves 19 de marzo, la nueva Licenciatura en Moda, Innovación y Tendencia.